This Vazhakkai Kootu is something different from Vazhakkai curry & Podimas. This tangy type of kootu which is made of lentils, plantain and spices. 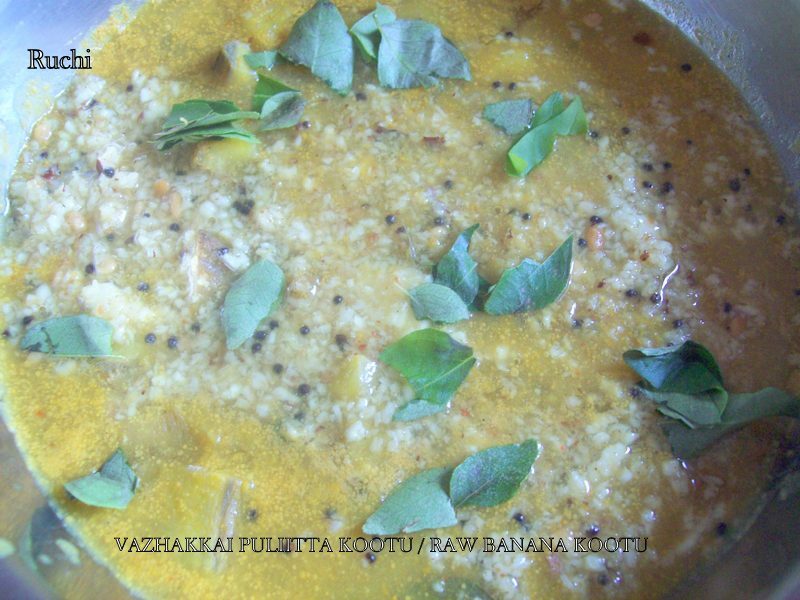 This Raw Banana kootu boil in lentils, tamarind water with jaggerry , sambar powder, add scraped coconut friend in coconut oil . It gives a great taste. You can serve it with Plain rice or accompanied by Mor Kuzhambu /rasam with papad. 1.Pressure Cook the dhal and keep it aside. 2.Cut the raw banana into small cubes and allow it to cook with tamarind extract and 3 tbsp of channa dal, sambhar powder, turmeric Powder salt & required water. 3.When the mixture starts to boil add the smashed tuvardhal& small amount of jaggery. 5.In a separate pan add the oil and Temper the mustard seeds, urad & channa dal , hing and grated coconut. 6.Roast the coconut well and add all the tempered items to the kootu. 7.Finally add a tsp of coconut oil for additional flavor. Now the delicious puliita kootu is ready to serve. 8.Mix with plain rice topped with ghee or serve as an accompaniment. Slurp, super tempting,fingerlicking kootu..Just love it.